I’m going to make kind of an odd comparison here. Stay with me until the end though and hopefully this will make sense by the time you’re done reading this post…. There’s a restaurant in Ohio called B-Spot Burgers. It’s been voted to be the top burger place in the United States for the last four years in a row. It’s run by a gourmet chef named Michael Symon and features the highest quality meats, hundreds of different combinations of ingredients that can be used to create custom burgers and an excellent selection of craft beers. Down the street from B-Spot burgers, there’s a McDonald’s. So let’s say you finish a race and you want to go out for a post-race burger and a beer. Which of the two places that I just mentioned sounds more appealing to you? If you think that sounds like a dumb question, you’re right. But there’s actually a deeper question here that’s not so dumb: McDonald’s is a multi-billion dollar global corporation with more than enough money to hire an army of top notch gourmet chefs that could easily create mind-blowingly delicious meals if they wanted to. So why can’t McDonald’s produce a decent burger? The answer is simple, but it’s probably not what you would think: the reason you’ll never see gourmet chefs at McDonald’s is because hiring them would conflict with the company’s business plan, which is to produce consistent food at every location. Have you ever noticed that if you eat a McDonald’s cheeseburger in Chicago it tastes exactly the same as one you would eat in Dallas? Or Singapore for that matter? That’s intentional and McDonald’s has gone to great lengths to ensure that that’s the case. From a business point of view, this makes perfect sense. Standardized processes are cost effective and easy to manage and enforce. The problem is that as you standardize processes across more and more locations, it usually comes at the expense of quality. All of the food that gets produced at McDonald’s uses specific types of ingredients that can be found anywhere in the world, regardless of whether or not there might be better ingredients available in certain locations. McDonald’s workers also follow a strict set of processes to cook, clean, take out the garbage, etc…. The processes they follow might not be the best ways to do these things, but they are the easiest ones to standardize. Have you ever stood in line inside of a McDonald’s and noticed all of the bells and buzzers going off in the kitchen to let people know when to pull the fries out of the oil or flip the burgers over? That’s all part of the plan. If the McDonald’s operations manual says that a Big Mac patty has to be cooked for 47 seconds on each side in Los Angeles, it will also be cooked for 47 seconds on each side in London. Not 46… not 48. A gourmet chef would want to use locally sourced ingredients and improvise on the recipes based on what’s in season. If the goal is to keep things consistent across every location globally, that isn’t going to work. You have to use the same ingredients and processes everywhere, which usually means reducing quality down to the lowest common denominator to ensure that you can accommodate everyone. This brings me to the Rock n Roll Marathon Series from Competitor Group. When I ran my first Rock n Roll Marathon in Nashville in 2006 (which was called the Country Music Marathon at the time), it was a unique experience. I ran Rock n Roll Arizona a few months later and it was a totally different experience. At the time, there were only four races in the Rock n Roll Marathon Series and while San Diego based Competitor Group was the overall headquarters for the series, the individual races were organized locally and each one had its own unique local feel. Over the last several years, the Rock n Roll Marathon Series has expanded to more than 30 different cities across the globe and as part of that expansion, Competitor Group has had to centralize its operations and standardize a lot of its processes. This has given runners a consistent experience across every Rock n Roll Marathon series race, but it’s also made the races feel a lot more formulaic and less unique. Last year I ran Rock n Roll DC, Rock n Roll Chicago, Rock n Roll Virginia Beach, and Rock n Roll Philadelphia. By the time I finished all of them, I started to feel like I had just run the exact same race four times but the start and finish lines just happened to be in different cities. Did I just compare one of the biggest race series in the world to a fast food chain? Yes I did…. Now don’t get me wrong, I enjoy the Rock n Roll Marathon series races. And I’m not saying that you shouldn’t like them. In fact, I specifically picked the Rock n Roll Chicago 5K to be my daughter Sara’s first race because I knew she would enjoy the experience. What I’m saying though is that over the last few years is feels like Rock n Roll Marathon races have become cookie cutter races with a lot of the same elements. While I was writing Southern Fried Running, I noticed that the chapters about Rock n Roll Nashville, Rock n Roll Savannah, Rock n Roll New Orleans, and Rock n Roll Virginia Beach all seemed to overlap with each other. The expo layout, major sponsors, schedule of events, starting corrals, water table locations, number of runners, etc… are usually the same or very similar. 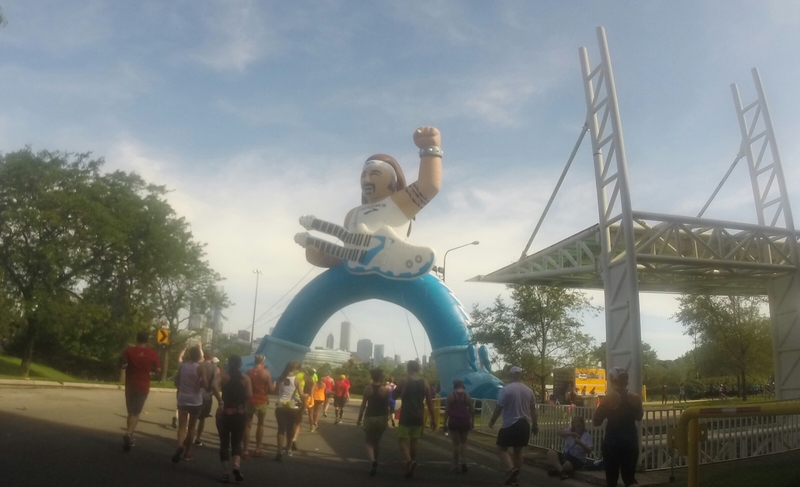 I really don’t have much to say about the 2015 Rock n Roll Chicago Half Marathon because if you want to know my thoughts on it, you can just go back and read my post about the 2014 race. Or any of the other Rock n Roll races that I’ve written posts about for that matter. In 2015, the heat and humidity were awful during race weekend. The forecast predicted a 105° F heat index. I’m not sure if it ever got up that high, but temperatures were definitely in the 90’s with high humidity. Running this race was extremely uncomfortable. There were more than a dozen runners who had to be taken to the hospital because of heat related issues. I’m not blaming the race organizers for the uncomfortable running conditions. Like I said in my post about the 5K, if you’re gonna run in Chicago, you should be prepared for extreme weather. Why didn’t anyone at Competitor Group say “Hey, since there’s a heat advisory in Chicago during race weekend this year, maybe we should look into setting up some cooling centers along the course like we do in Virginia Beach”? I’m sure that there were some people who thought about doing exactly that. Nobody ever actually acted on it though because doing so wasn’t included in the standard set of directions sent from the corporate headquarters that told the volunteers exactly how to set up the Rock n Roll Chicago course. Bringing in additional cooling facilities would have required things like change requests and management approvals. Standardized processes typically only work well when all of the conditions are ideal. If this had been a truly local race that was run by a group of Chicago running enthusiasts as opposed to a big corporation headquartered in a different city, I have no doubt that there are a lot of things that would have been handled differently on race day. Now, if you’ve read any of my other posts about Competitor Group or Rock n Roll series races, you’ll probably want to call me out at this point because I typically write about what an innovative company Competitor Group is for coming up with the idea to combine the experience of running a marathon with the experience of going to a rock concert. Here’s the thing though: I still believe that and it’s not at all inconsistent with what I’ve written in this post. Competitor Group has absolutely managed to build one of the most innovative brands in all of sports (not just running). But along those same lines, McDonald’s is also a very innovative company. McDonald’s got to be as big as it is by managing to successfully combine elements of the restaurant industry with elements of the real estate industry. It was Ray Kroc’s vision to build his company that way. That doesn’t mean that McDonald’s makes the best burgers you’ll ever eat in your life though. Innovation and quality are two different things. So, like I said, there’s nothing wrong with the Rock n Roll Marathon Series. The races are fun and you’ll pretty much always know what to expect whenever and wherever you decide to run one. 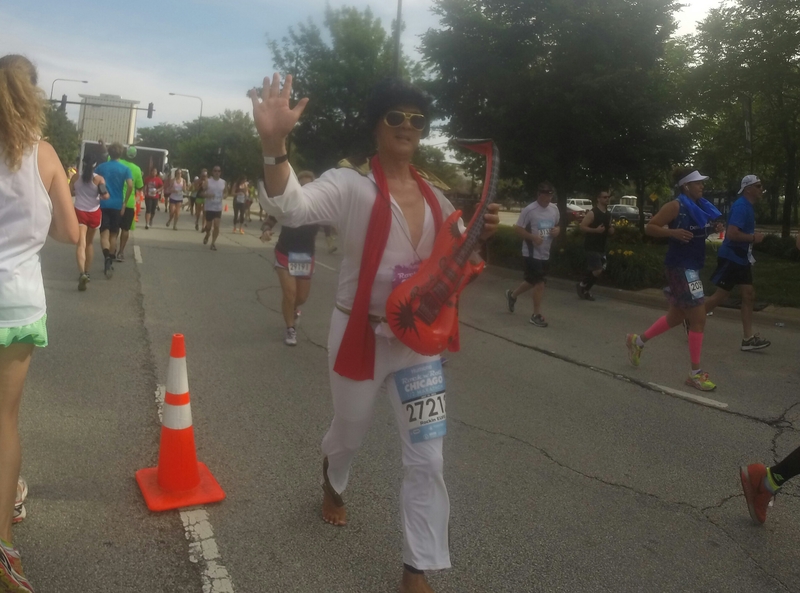 And honestly, I’ll probably do Rock n Roll Chicago again next year – I have a ton of friends who run it every year and it’s always great to see them and run with them. I’m not trying to trash Competitor Group either. They’re doing what they need to do to grow their brand. Every business eventually comes to a point where it has to try to standardize its processes if it wants to properly manage its growth. It is what it is. The only thing I’m really saying here is that if someone were to ask me what the best half marathon is to do in Chicago, I would have a very hard time recommending Rock n Roll Chicago when there are so many other half marathons around the city that have more of a uniquely local feel to them. Now that I’m done writing this post, I think I’ll go grab a burger…. RnR Chicago is the 9th time Barefoot Elvis has made an appearance. Elvis is appropriate for Rock ‘n’ Roll, so this year I decided to go on a road Tour across the country (I’m from San Diego). With race prices increasing every year, it’s nice that CGI keeps costs down (especially if you sign up early). RunDisney races are at the high end, but it’s not uncommon to pay over $100 for a Half nowadays. Like McDonalds, RnR races are a good value, and if you Tour, you meet great people from all over the country.